In Sicily, we have a mushroom season in full swing. This weekend, we went to the mountains and picked excellent porcini. 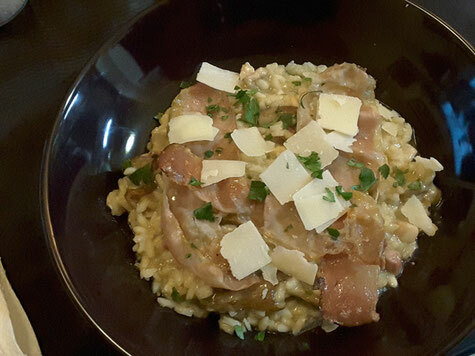 Our wonderful Vincenzo, one of the best chefs in Sicily, prepared the superb risotto with porcini and bacon. We share with you this original recipe. 1. Porcini - 500 gr. Peel, wash, dry and chop coarsely. 2. 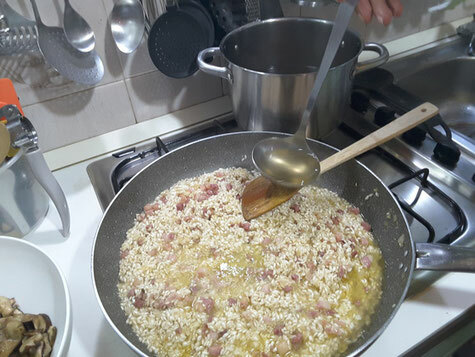 Rice for risotto – 600 gr. 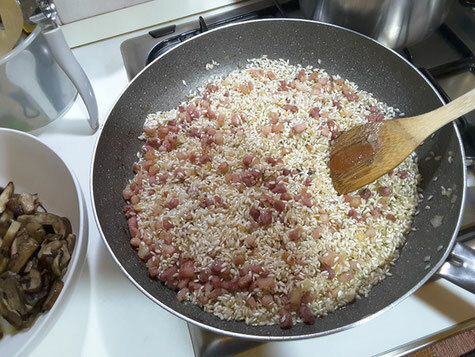 For example, carnaroli or arborio. 3. Brisket meat – 200 gr. Cut into small cubes. 4. Bacon - a few thin slices. Fry until crisp. 5. Onion - 1 medium piece. Finely chop. 6. Garlic - 2 gloves. Finely chop. 7. Butter - 50 gr. 8. White wine - 150 ml. 9. Vegetable broth - 1 liter. 11. Parsley - finely choped. 1. 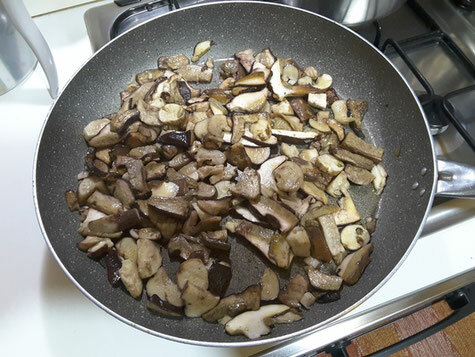 In a large frying pan warm up olive oil and fry the mushrooms until almost cooked. 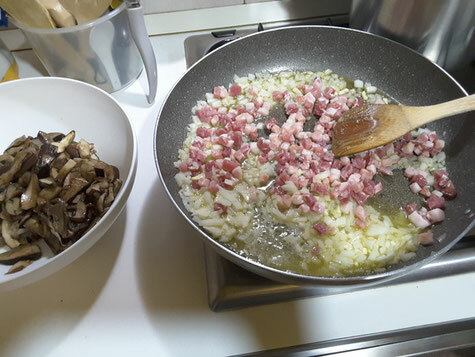 Put the mushrooms in a bowl. 2. 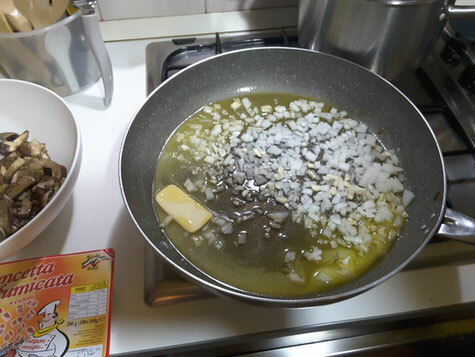 In the same pan, melt the butter, add a little olive oil and fry the garlic and onion until light golden. 3. Add diced brisket to the pan. Fry on medium heat until golden brown. 4. 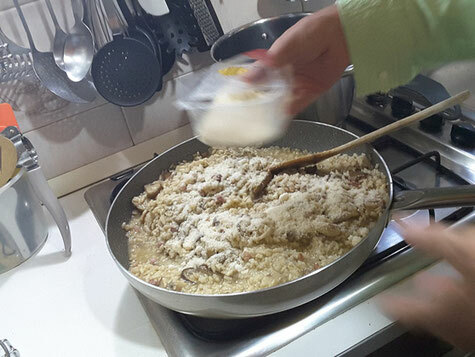 Put rice to the pan. Thoroughly mix. 5. Pour white wine. Evaporate the wine, stirring constantly. Important that the wine doesn't boil. 6. When the wine has evaporated, add broth. Pour it by little, two buckets at a time, then wait until the broth is absorbed and pour the next batch. 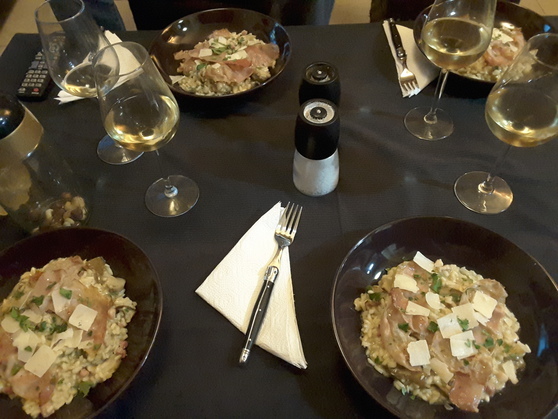 It is important to constantly stir the risotto. 7. 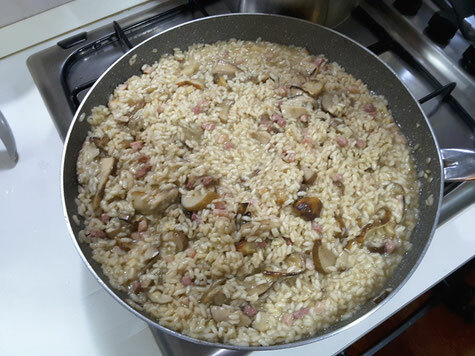 When the rice is "al dente" add the mushrooms. Mix and keep a couple of minutes on fire. 8. 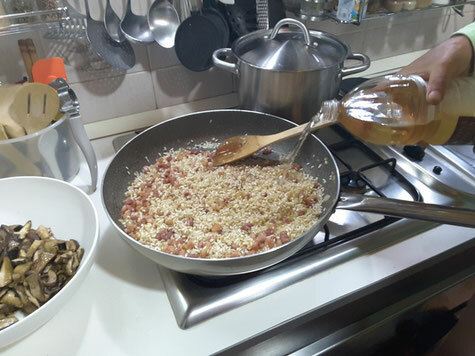 Remove from heat, add parmigiano and stir. 9. Put risotto on plates, sprinkle with parsley and put fried bacon on top.